With our ER™ EASY REPLACEMENT pack for the 25 Person First Aid Kit, you'll save money by not replacing your whole first aid kit when only a few items expire. ER™ First Aid Kits contain the longest lasting, most reliable emergency first aid supplies available. But a few items still need to be replaced periodically. 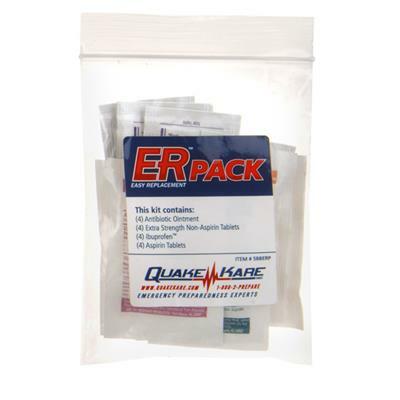 To save you time and money when replenishing the expired first aid supplies in your kit, we have designed the ER™ Easy Replacement Pack. Just swap out the expired supplies in your first kit with the new supplies from the replacement pack and you will be prepared for a disaster for another 4-5 years. The 25-Person ER™ First Aid Pack contains all the supplies to replace expired items from the 25-Person ER™ First Aid Kit. Dimensions: Single (1): 3 x .5 x 4.5"
Instructions: Replace expired items in first aid kit with new items in replacement pack.